Step 1 Trim the pork tenderloins, removing any loose pieces of meat. Remove the silverskin: Slip a paring knife underneath it and cut one end free. Grasp that end tightly and lift up, scraping the silverskin with the knife to separate it from the meat. Repeat until all silverskin is removed. Place the tenderloins in a zip-lock bag. Step 2 In a large bowl, stir together one-third cup salt, sugar and water until completely dissolved. Pour the mixture over the tenderloins, seal tightly and refrigerate overnight. Step 3About 90 minutes before serving, cut the potatoes into pieces about the size of walnuts. Cut off the top and bottom of the red onion and cut the onion into half-inch wedges. Place the potatoes and onion in a heavy skillet, sprinkle with 2 teaspoons salt and drizzle with the olive oil. Toss to coat well. Step 4Place the skillet over medium-low heat, cover and cook for 30 minutes, checking after 15 minutes to stir. Stir gently to keep from separating the potatoes from the browning surface: shaking the pan from side to side will free most of the potatoes; those that stick can be gently pried loose with a thin spatula. Step 5After 30 minutes, remove the lid and continue cooking, carefully stirring occasionally, until the potatoes are well-browned and crusty, another 30 to 40 minutes. Add the minced rosemary, reduce heat to very low and continue cooking another 10 minutes. The potatoes will hold this way until ready to serve. Step 6While the potatoes are cooking, start the pork. Soak about 1 1/2 cups of wood chips in water to cover. Light the coals in a chimney and when the coals are glowing hot, empty them into one side of the grill, banked against the side. Drain the wood chips and place on top of the coals. Step 7Pat the pork tenderloins dry with paper towels and place the meat directly over the flame to sear for 3 to 5 minutes. Turn and sear on the other side for another 3 to 5 minutes. Move the tenderloins to the cooler part of the grill, cover and cook 6 to 10 minutes or until the temperature reaches 150 degrees on an instant-read thermometer. Step 8When the tenderloins are done, remove them to a carving board and let them rest 5 to 10 minutes. Slice them into half-inch thick medallions and put them on a warmed platter along with the crusty fried potatoes. Serve immediately. In Recipes-list.com we have selected the most viewed recipes from category - Grilled Main courses . Enjoy the best recipes specially selected for you! 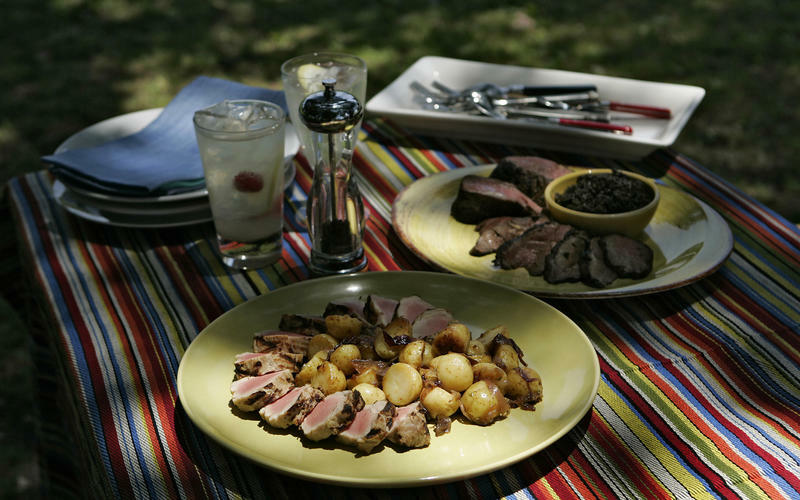 Brined pork tenderloin with `Tuscan home fries' is the right choice that will satisfy all your claims.